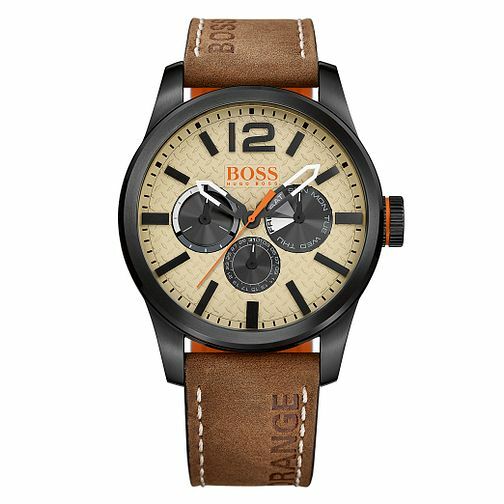 Boss Orange Men's Grey Dial Brown Leather Strap Watch is rated 3.0 out of 5 by 2. Rated 1 out of 5 by Anonymous from Came faulty One of the hand on the dial was detached and rattling around inside the watch. Rated 5 out of 5 by Anonymous from VERY NICE WATCH THIS IS THE SECOND HUGO BOSS WATCH I HAVE BOUGHT, IT FEELS GOOD QUALITY, NICE DESIGN, I LIKE TO TRY DIFFERENT STYLES AND THIS FITS MY CRITERIA.